Color: Custard Satin with Green, Brown, and Yellow Bamboo and Butterflies, outlined with Orange Red Trim. 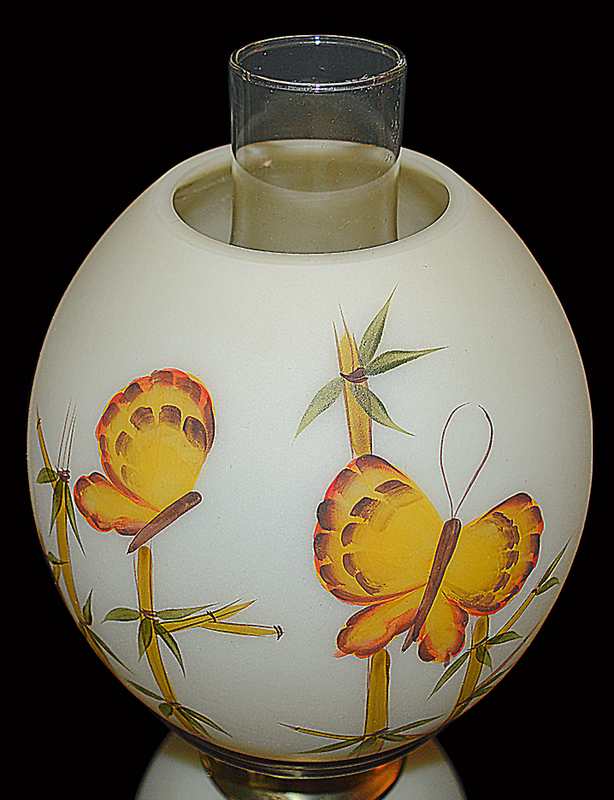 Signature: "Fenton Hand Painted by George Schlicher"
Description / About: Butterflies and Bamboo Lamp: 18 1/2" H. - 6" W.
Condition: Our striking Butterflies and Bamboo Lamp was only made for one year which makes it difficult to find. This fantastic lamp has a stunning hand painted design that combines butterflies and bamboo to create a dramatic effect on Fenton's cream satin colored base. The lamp is in Undamaged Condition without chips, cracks, or mold damage. The hand painting is excellent--very delicate and precise. The lamp is artist signed by Fenton artist, George Schlicher. The burnished brass looks like new. The cord is in nice shape. It has a 3 way switch for different light combinations paired with a night light in the base. The lamp is in good working condition. The lamp even has its original tag still attached to the cord. It would be difficult to find a lamp in nicer condition than this one. We show an original 1981 catalog page. This is for informational use only and is not for sale with the lamp. Our striking Butterflies and Bamboo Lamp was only made for one year which makes it difficult to find. 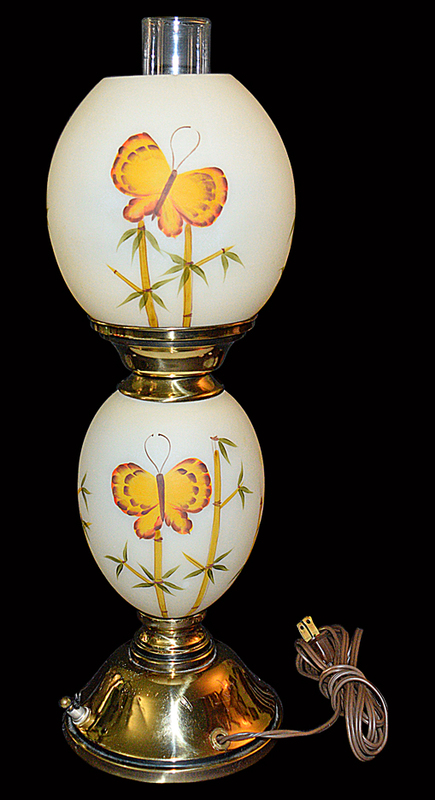 This fantastic lamp has a stunning hand painted design that combines butterflies and bamboo to create a dramatic effect on Fenton's cream satin colored base. The lamp is in Undamaged Condition without chips, cracks, or mold damage. The hand painting is excellent--very delicate and precise. The lamp is artist signed by Fenton artist, George Schlicher. The burnished brass looks like new. The cord is in nice shape. It has a 3 way switch for different light combinations with a night light in the base. The lamp is in good working conditon. The lamp even has its original tag still attached to the cord. It would be difficult to find a lamp in nicer condition than this one. We show an original 1981 catalog page. This is for informational use only and is not for sale with the lamp. Fenton Butterflies and Bambo (1981) Fenton's Butterflies and Bambo design was applied to a Custard Satin background. 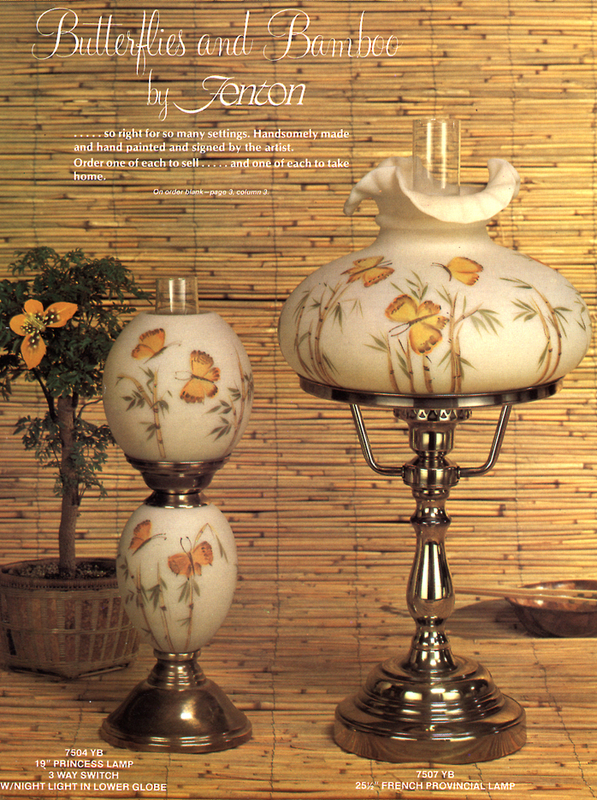 Two lamps were made with this whimiscal design--a Princess Lamp and a Provincial Lamp. Each lamp came signed by the aritst.